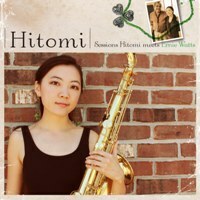 Description: Saxophonist Hitomi Oba was raised in Berkeley, California. While attending the award-winning Berkeley High School Jazz program, Hitomi studied saxophone, classical and jazz piano, and composition, while dabbling in flute and voice. She studied ethnomusicology and jazz at the University of California at Los Angeles, and later completed her MA in Music Composition at UCLA. She has performed at various venues across the country and internationally, including at Yoshi's Jazz Club, the Monterey Jazz Festival, the Montreux Jazz Festival, the Sapporo Jazz Festival, and the Umbria Jazz Festival. Among her awards of recognition are those in composition from the NFAA Talent Search, saxophone awards from numerous jazz festivals, and a Downbeat Student Music Award for Composition. She performs her compositions regularly with her own group as well as with others in the U.S., Japan, and abroad. Hitomi has so far released three albums as a leader from Japanese M&I label. Her second album, Negai, received the ?????? ?Swing Journal 42nd Annual Jazz Disc Awards, New Star Award?????? ?, following the critically acclaimed first album, First Flight. Her latest album features tenor saxophonist Ernie Watts on five tunes. Hitomi, whose idols are John Coltrane and Wayne Shorter, holds her own against the legendary musician, and they both perform inspired solos in different styles. Hitomi's tone is slightly darker while Watts executes clear musical ideas with a variety of technique. In this excellent showcase of her talent, Hitomi is supported by an excellent rhythm section led by John Beasley on piano and Stan Gilbert on bass. She is a wonderful new talent, and this special album with Ernie Watts is a great place to start geting to know her! Recommended! Recorded December 4 & 5, 2009 at Stagg Street Studio, Los Angeles.